Reading great books with my children is definitely one of the major reasons I love homeschooling. Especially in the early years, I believe the best thing I can do for them is read, read, read together. However, I often struggle to chose good age appropriate books. I love that Memoria Press takes the guess work out of choosing great literature with their curriculum. With Memoria Press, not only are the good books already chosen for me, but their study guides help me teach my children through literature. My 1st grader, Peyton and I had the opportunity to review the More StoryTime Treasures from Memoria Press last month. 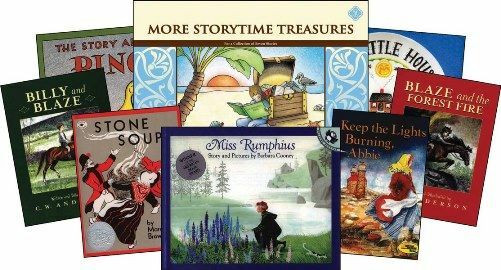 This curriculum includes a Student Guide and Answer key(the answer key includes answers for both the StoryTime Treasures and More StoryTime Treasures student guides). It includes lesson plans for 7 books with 2 to 3 lessons per book. I find completing one book a week the perfect pace for using More StoryTime Treasures. For each story the guide has sections on Word Study/Say Each Word, Read each sentence and define the bold word, Comprehension Questions/Gill-in-the-Blank, Language Lesson, and Just for Fun. Peyton is a struggling reader, and is not yet writing sentences. Even though she’s currently in the second half of her 1st grade year, I found that she is not ready for this program. Her reading and writing skills just are not nearly at the level the curriculum presents. I should have started her with the 1st level StoryTime Treasures in the second half of first grade and completed this book (More StoryTime Treasures) over the summer. I think this curriculum could be a good choice for an average or advanced 1st grader, but not a struggling 1st grader. Two of my four children would have loved and excelled with it, while the other two would not have been ready for it during their 1st grade year. Now, that being said, Peyton has still enjoyed this curriculum. The stories are fabulous. Instead of Peyton completing the student guide, we do all the reading and activities orally. Struggling readers often don’t expand their vocabulary because their ability to read is limited, even though their brains are ready to speak and understand bigger words. The word study sections of this guide have reminded me that Peyton still needs that advanced vocabulary instruction even if it’s oral rather than written! The comprehension questions are well thought out, and Peyton has to really listen and think about each story to answer the questions. This is my favorite part of the curriculum- picking the story apart with her and discussing the important parts and what they mean. Peyton’s favorite part is the Just for Fun section as is often includes art activities. She loves doing fun things like drawing her own book cover and writing her own stories using what she’s learned. I really love this literature guide, even though Peyton can’t do the work independently yet. I look forward to choosing other literature curriculums from Memoria Press as she grows and becomes a stronger reader. Connect with Memoria Press on Facebook, twitter, Instagram, LinkedIn, google +, and pinterest.